At least – it has some plot! Yes, it happened! The well-known manufacturer Makro just announced three new metal detectors of the new series – Gold Kruzer, Kruzer, and Multi Kruzer! 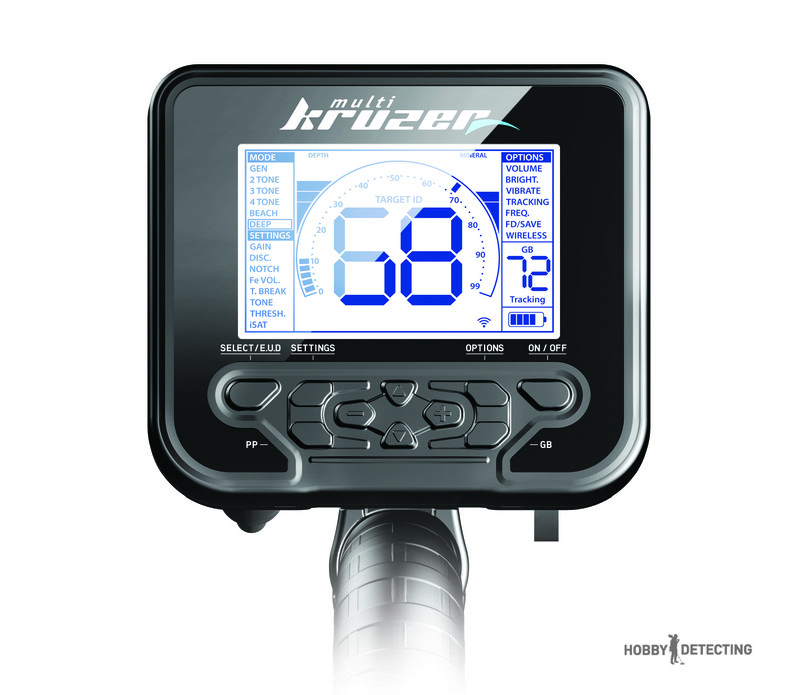 The only difference between these different models are the frequencies – the Multi Kruzer has multiple frequencies, while the Kruzer has one. The gold Kruzer model has a frequency of 61 kHz and is designed specifically to search for gold! Our small team participated in the testing of the Multi Kruzer model, and the prototype did indeed show itself to the fullest. It even survived a 20-minute long exposure to cold water (+2 C)! What is new with the Kruzer metal detectors? 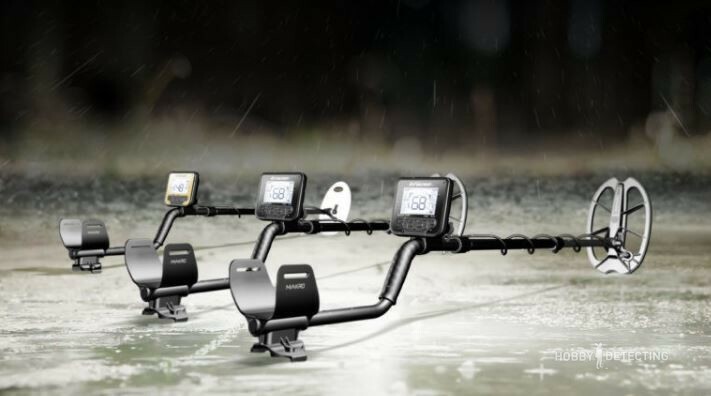 The complete line of Makro Kruzer metal detectors currently consists of three models – Makro Kruzer, Makro Multi Kruzer, and Makro Gold Kruzer. Waterproof to 5 m, standard IP68. By the way, these are the first metal detectors in the world that comply with the IP68 standard. Excellent discrimination and identification of targets underground. Ultra-fast recovery speed in 3-tone mode (works on a sensitivity of up to 90). 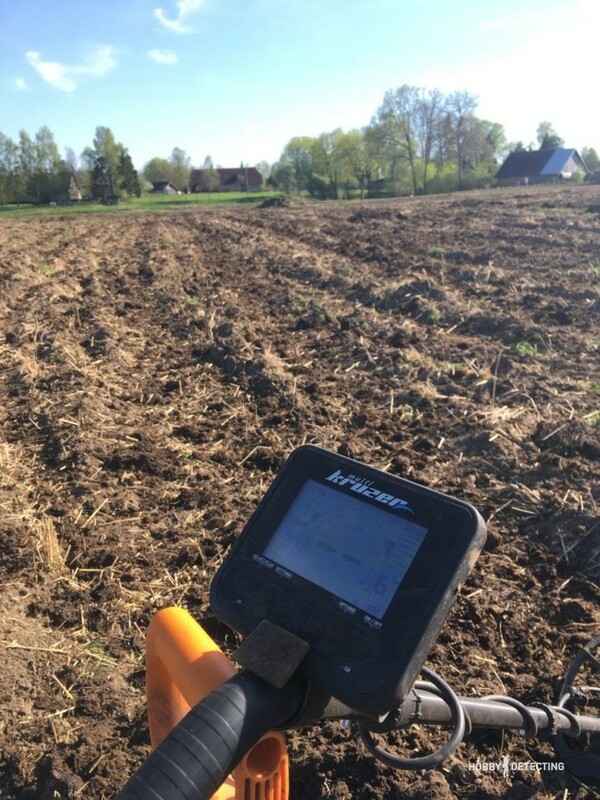 A new function called EUD (Extra Underground depth) – for detecting in heavily iron-infested soils and in places with high mineralized soils. It can work on the beach with salt water and sand. Highly improved suppression of EMI (Electromagnetic Interference) – this means that it is possible to detect with it under high-voltage lines. The weight – only 1.3 kg! A built-in rechargeable battery which lasts for up to 19 hours. The ability to charge the battery during detecting either with a powerbank, or an optional cartridge for AA batteries. The cartridge for the AA batteries is also waterproof. 5 additional coils, including 1 mono coil! Software updates through the Internet! This detector will be available in February! The Makro Kruzer is a single frequency detector, and it only differs from the metal detector Multi Kruzer by the number of frequencies. This model is cheaper, but in terms of quality and search characteristics it is not inferior to the Multi Kruzer and Nokta Impact because it works on the same circuit, but only with one frequency that is 14 kHz. The number of search modes is exactly the same as the Multi Kruzer model – there are 6 of them. Consequently, it can be assumed that this model will be good for those who do not need two additional frequencies (5 and 19 kHz). The detector is also waterproof. In general, as in my opinion – the most optimal solution. Of course, additional frequencies are always useful and interesting, but in most cases, we always dig at one frequency and few really check their places working on other frequencies. 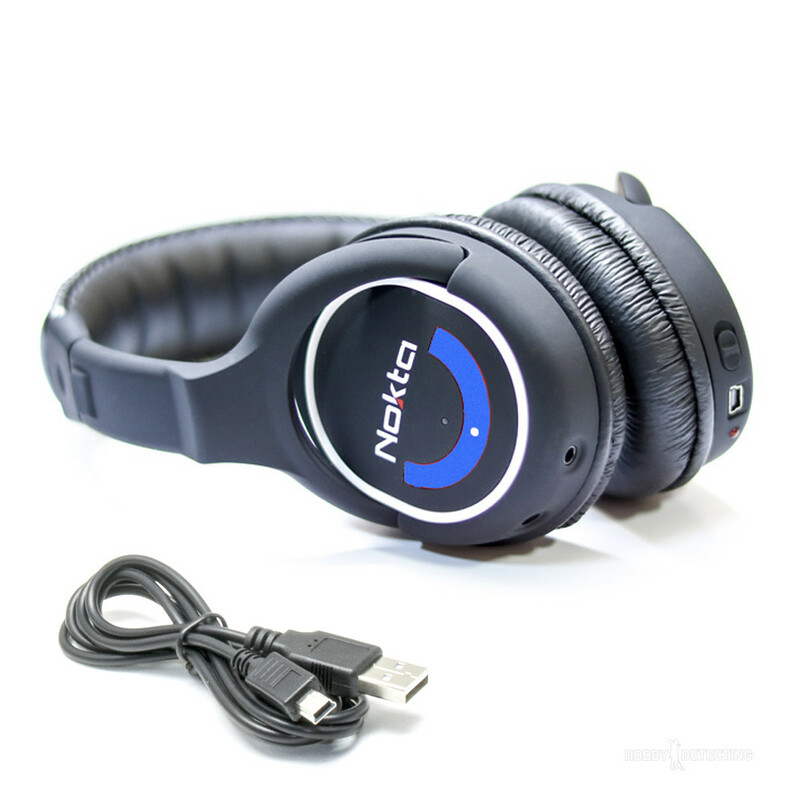 It comes standardly equipped with an 11 “DD coil, charging and wireless headphones from Makro. This is probably the top model from Makro at the moment. 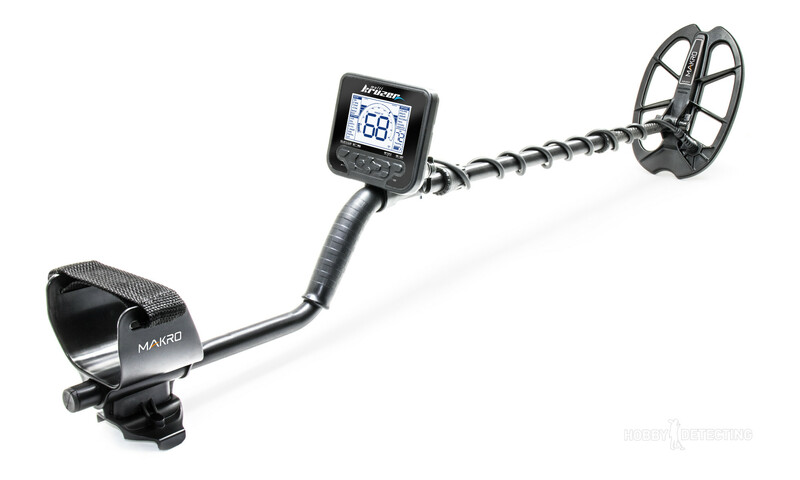 This is a three-frequency (5/14/19 kHz), a waterproof metal detector with 6 search modes. All the same as with the Kruzer, but with two more frequencies. In general, the solution for those who need additional frequencies. The price difference from the Makro Kurzer will be small, so the option is for those who are ready to pay a little more. The Makro engineers promised in their advertising brochures that with this metal detector all the old search sites will bring us new finds. True or not – time will tell, but the novelty really looks very interesting! 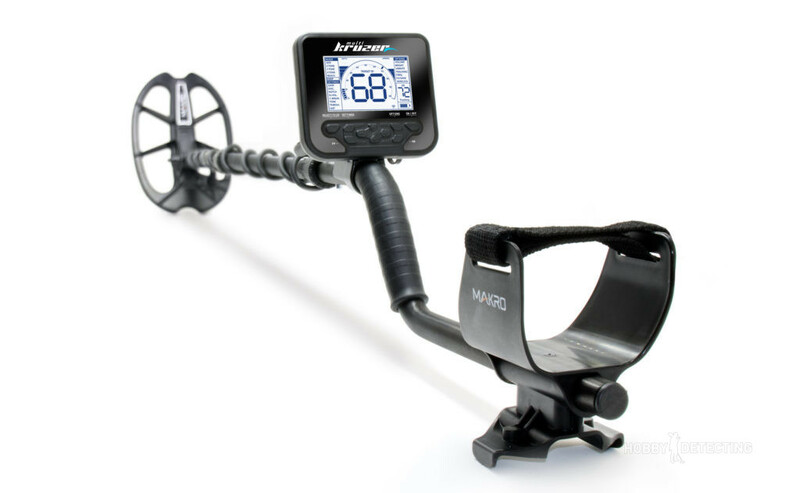 In many ways, it repeats the contours of the metal detector Makro Racer and MR2, but with added water resistance and the presence of three frequencies. One of our recent tests showed that Multi Kruzer in the same modes with the Makro Racer 2 sees the targets a bit deeper, the test was carried out for 3 kopeks from 1945, buried at a depth of 25 cm. This metal detector also comes with a regular 11 “DD coil, as is the Kruzer, wireless headphones and charging are also included. A detector for searching for gold and different jewelry on the beach. In our region, it will not be very common, because with a frequency of 61 kHz this detector will find all that scattered fine foil on the beach, but to find nuggets on heavy soils it will be a real helper. It comes with two coils: GK26C (mono coil) with a size of 10×5.5″ and a GK19DD (DD coil, as the name implies) with a size of 7.5×4″. It also has a set of wireless headphones. This detector is waterproof, like all the others in the line. 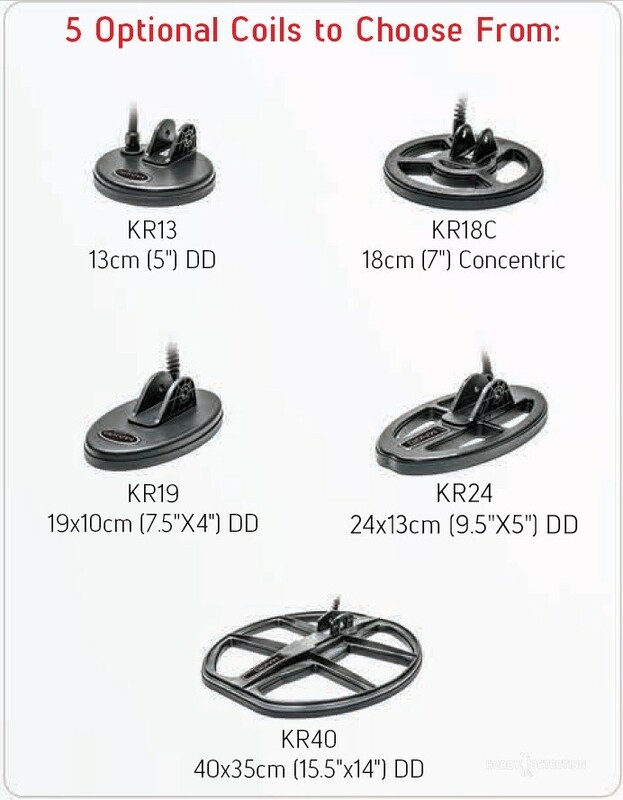 In addition to the regular coil (11″ DD KR28), the manufacturer has prepared a whole set of additional coils for the metal detectors Makro Kruzer and Makro Multi Kruzer. This is a set of coils that are made in one form with the coils for the metal detector Nokta Impact. There are snipers – KR19/KR24, round sniper KR13, concentric (mono) coil KR18C and “steering wheel” KR40. The first two snipers are good for heavily iron infested places, detecting in the woods and hard-to-reach places. A round sniper coil shows itself well in a large trash infested area because of its size (5 “). A concentric coil also brings its finds and there is a certain percentage of detectorists that work with mono coils because they have their advantages. And the “steering wheel” KR40 is great for detecting in open terrain and fields, giving an excellent depth in the search for finds! On the search modes, it is worthwhile to stop in more detail. 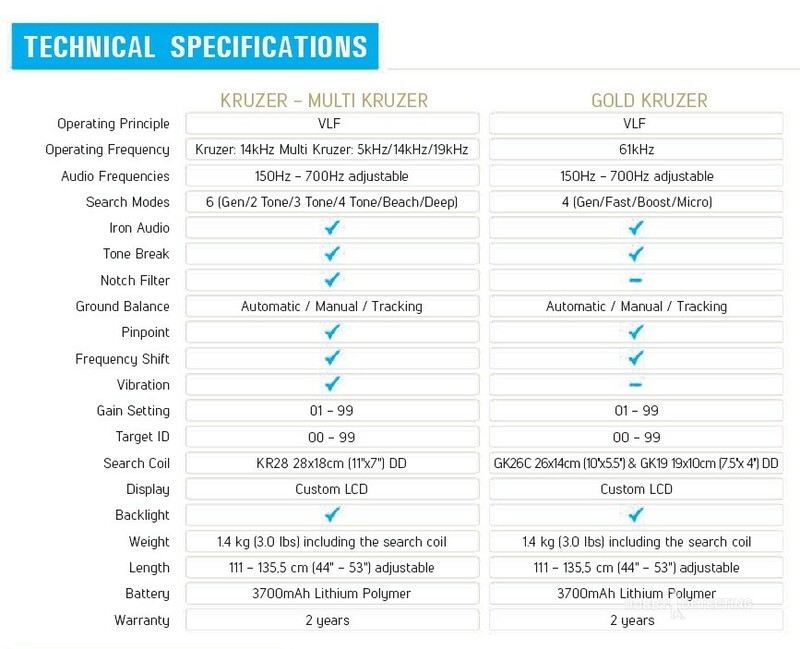 The metal detectors of the Makro Kruzer series are built on the Nocta Impact scheme, but the number of modes has been reduced, so let’s take a quick look at the settings of the metal detectors. It’s good to have the display in front of you. ? General search mode. 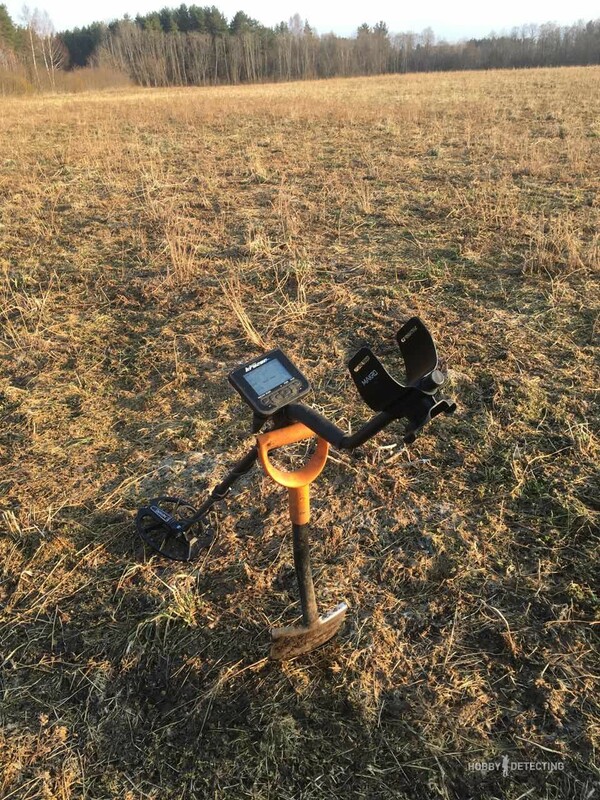 Suitable for detecting in already “empty” fields and places where it is necessary to dig all metals. In many aspects, it is similar to the mode “All metals” in other metal detectors, but it makes it possible to adjust the threshold tone level (THRESH. ), which is very important for finding especially small coins and relics. 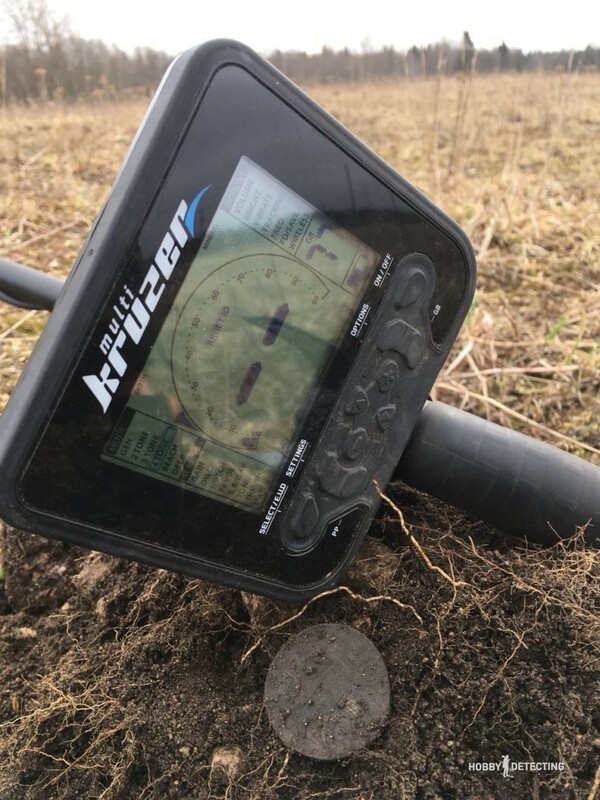 We recommend it to use for places where there for years they have been other detectorists digging and it seems that most of the coins have been found. This is the deepest search mode after the DEEP mode, of course. This is the mode of two-tone discrimination. Iron will sound in a low tone, and all that is more or less different will have a higher tone. In this segment, iron targets are on the scale to 15, and from 15 to 99 you have targets from non-ferrous metals. The tone transition can be changed with the TONE BREAK setting, that is, raise the lower tone on the VDI or lower it to hear a certain metal and VDI targets below 15/10 (for example, small pieces of gold). This is the deepest mode of all disc. modes. It is recommended to use it for “reconnaissance” in new places, for example. This is the mode of three-tone discrimination. Iron sounds in a low tone, and the “good” segment is divided into two tones – medium and high. The low tone will sound for objects from 0 to 15, medium tones for objects from 16 to 66 and a high tone for objects from 67 to 99. With sensitivity up to level 90, this mode is the fastest in response speed, and therefore it can be perfectly used in trash-infested places. Above 90 – already suitable for detecting in very littered areas. This is the mode of four-tone discrimination. In this case, the iron sounds in a low tone, and the “good” segment is divided into 3 different tones. The low tone from 0 to 15, low to medium tone from 16 to 30, high-medium tone from 31 to 66 and high tone from 67 to 99. In this case, the engineers of the company Makro went a little further and listened to the suggestions from many diggers and testers to make the mode 4 tones more useful and informative than before. Now, this mode has become noisier and it is worth noting that the detector becomes noisier when you hold the coil in the air, rather than above the ground. In the Kruzer series of metal detectors, the 4-tone mode became deeper and more sensitive to small targets, which means it is now preferable to dig in 4-tone mode, than as before in the 2-tone mode. In addition, the tones of the 4-tone mode were changed, also at the request of diggers and testers. Naturally, a mode of 4 tones is better to use in the normal and slightly mineralized ground. Beach mode. Specially designed for beach searching in the surf area and on wet sand, and also in the water! On salty and wet sand it does not give off false signals, and it allows you to look for jewelry and various other interesting losses. It can also be used for freshly plowed dirt, where the soil is wet and mixed. 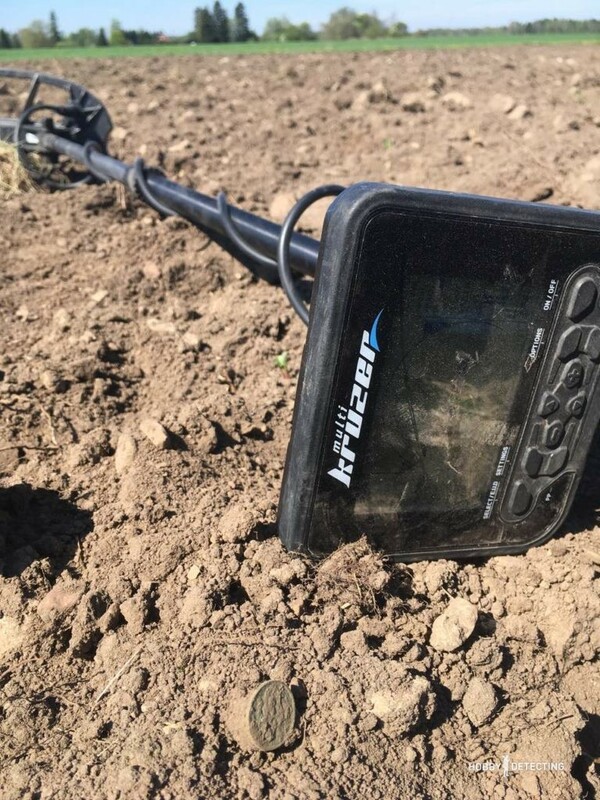 In this mode, the soil balance level is open to a value of 0-99.80, which makes it possible to better recover adjust to the ground. And in addition, the level of discrimination is set at 15 to discriminate and cut off false signals from the ground and ferrous metals. In this mode, the signal response is two-tone, standard 0-15 low tone and 15-99 high tone. With the T.Break option, you can shift the tone to higher levels, for example. Depth mode. Created to detect in small and “empty” areas, and it requires a slow coil sweeping. This is the deepest mode of all detectors presented in this series. In this mode, the detector operates noisily, but the noise is louder when the coil is in the air, and not above the ground. This mode is also two-tone – 0-15 low tone and 15-99 high tone. The tone pitch can be raised and lowered using the T.Break setting. Hidden mode, activated by double pressing the SELECT button. Allows you to see targets in difficult soils and under “hot rocks”. 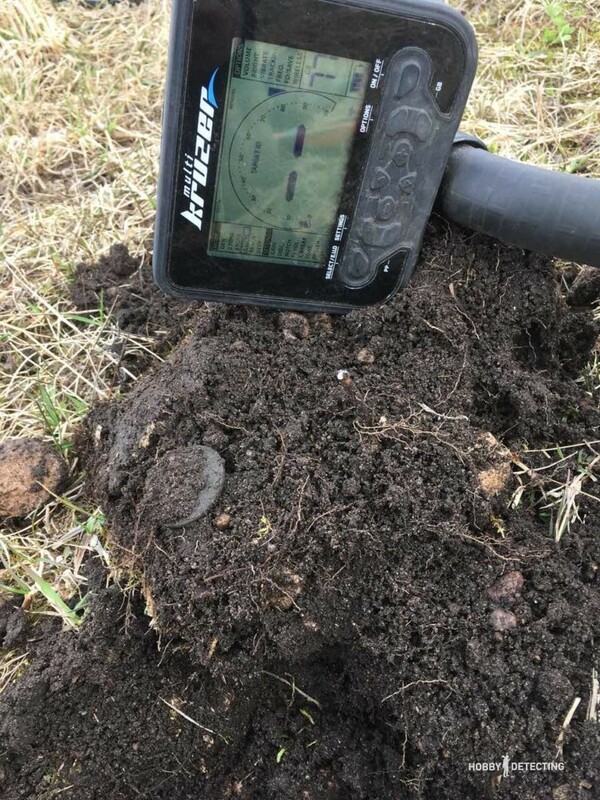 This mode can incorrectly determine the type of metal, and therefore it is better to dig it all because the probability of an error in determining the target in difficult soils is quite high. 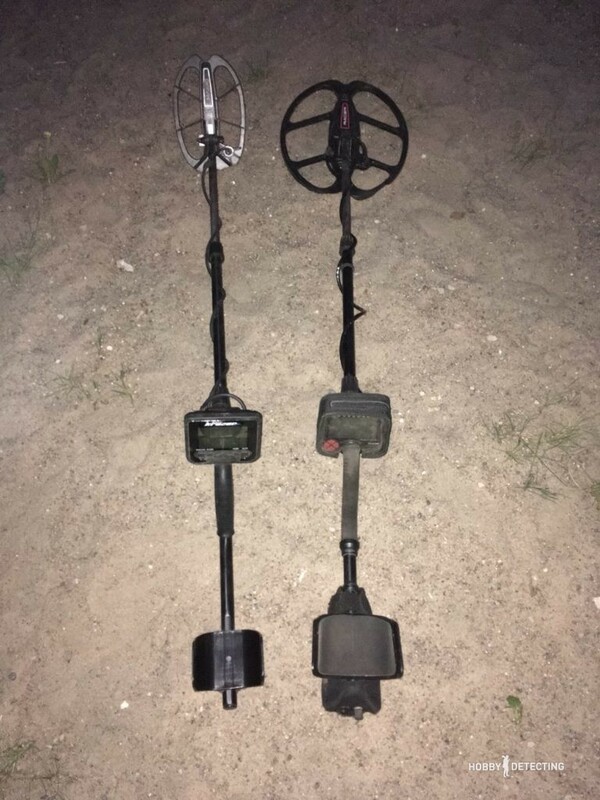 For the first time, such headphones appeared for the metal detector Makro Racer 2, and they were delivered together with a special transmitter that was inserted into the metal detector unit, and the kit itself cost almost 100 euros (just over $100). Now in the Kruzer Series of metal detectors, such wireless headphones are included in the delivery! The headphones are very comfortable and fit well on my head, I even put them under my hat to dig with them in the winter. The headphones are charged from the usual Mini-USB charging, and they keep the charge for quite a long time, you can dig a whole day without any problems. The volume of the sound is adjusted on the metal detector, so in addition to the power button and an additional button for connecting headphones to the metal detector, there are no other buttons on the headphones, which is very convenient. In case the detecting trip lasts for more than one or two days, an additional charger for the metal detectors of the Kruzer series is provided, which works on ordinary AA batteries. 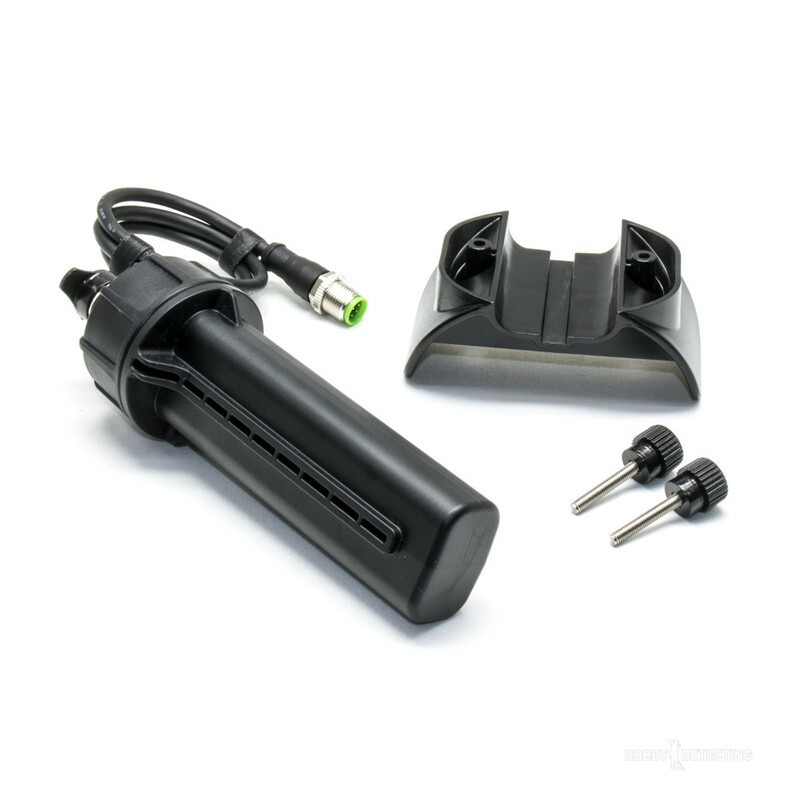 The charger is waterproof, it is mounted under the armrest of the metal detector with the help of special fasteners and two bolts. Convenient and practical! It is connected to a jack for charging the metal detector and operates on four AA batteries. It also has a connector for headphones. Charging is easy and does not cause discomfort when working with the metal detector. 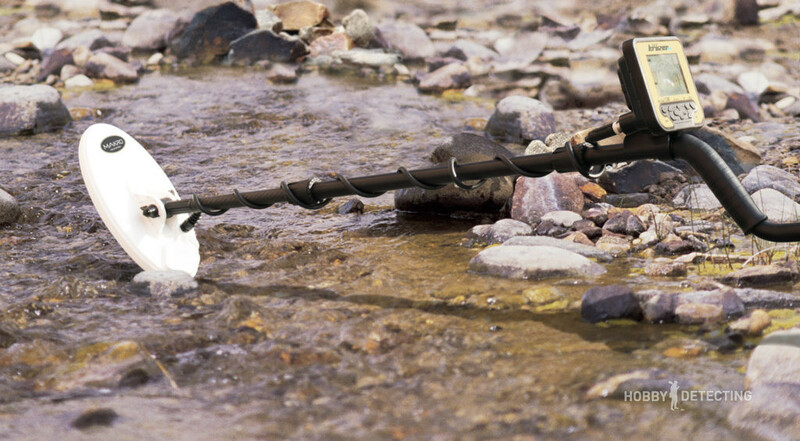 In one of our trips to test the prototype, we decided to give the metal detector a bath. And since it is winter and the ponds were frozen, and it is no point in testing it in the sea with all those waves and so on, we decided to drop it into the freezing water of one river that is not yet frozen. And what happened? 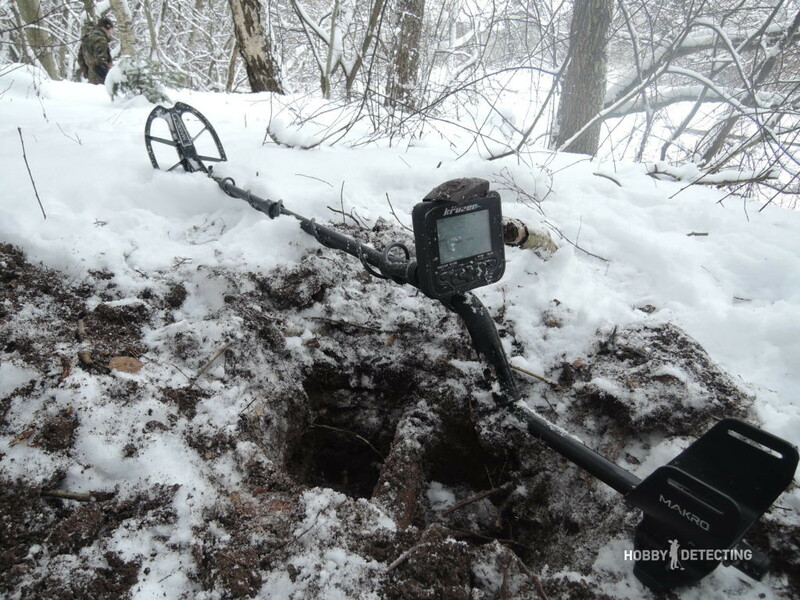 Honestly – we did not expect that the metal detector would withstand such a test because the cold is always a serious problem for any electronics. Well, the Makro Multi Kruzer withstood our craziness and it is still working without any problems! And at least we got to wash the detector! By the way, this river has very much loot in it. But the current is strong, it must be searched with a magnet, I think that in the spring we will tackle this simple task. And at the end of the test, the sun came out and lit the forest with its rays coming over the horizon. There is nothing better than seeing the sun like that in the winter forest! It operates according to the VLF scheme, on the frequencies: Kruzer – 14 kHz, Multi Kruzer – 5/14/19 kHz, Gold Kruzer – 61 kHz.The frequency of audio: (adjustable in metal detectors): 150 Hz – 700 Hz. Search modes: Multi Kruzer and Kruzer – 6 (General / 2 tone / 3 tone / 4 tone / Beach / Deep), Gold Kruzer – 4 (General / Fast / Boost / Micro). The weight of metal detectors is 1.4 kg, and the length is 111 cm to 135.5 cm maximum. The size of the built-in battery: 3700 mA and the warranty is 2 years. Greetings to you all detectorists! Now I want to share my personal thoughts about the new product from Makro. Last year, I purchased the Makro Racer 2 Pro kit, which includes a small sniper coil and a large, so-called “steering wheel” coil. The detector indeed left me satisfied, and the best words to describe it would be a coin vacuum cleaner. Before I could get enough of the idea that I own one of the most powerful metal detectors, Makro rolled out a new detector: The Makro Kruzer. When I first saw it, to be honest, I wasn’t too impressed, an S-shaped bar, a square control box with display and an 11” DD coil. The Kruzer, in comparison with the Racer, looked somehow simple. It was too lightweight and I do not know why, but at first glance I wasn’t too assured with the detector. 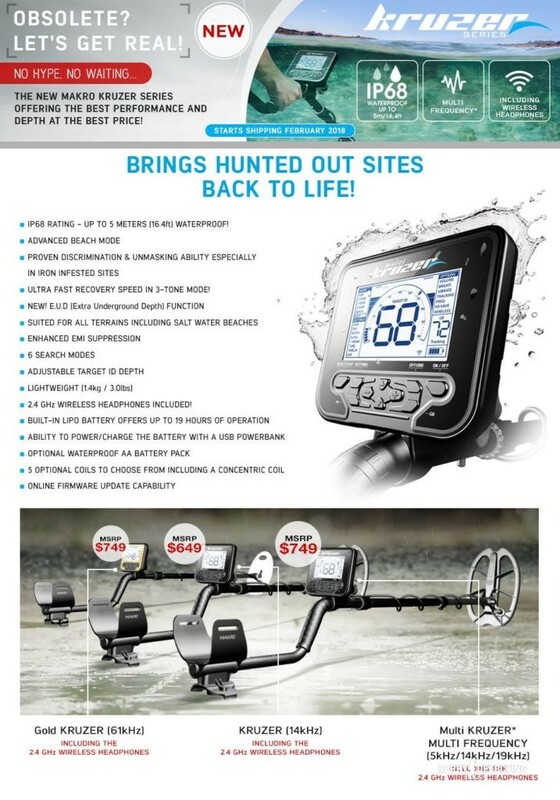 I thought – another marketing move, the main emphasis of which is on the multifrequency and the waterproofness of the detector, as it can be immersed to a depth of 5 meters. By the way, that was immediately tested in severe winter conditions. As I am not engaged in underwater detecting and the frequency of 14 Hz on Racer was quite satisfactory for me, I did not have much desire to try this detector in action. But by the will of fate, at the very beginning of the spring season, the Kruzer fell into my hands. I am like a child; having received a new toy, I immediately ran to test the detector in an area near the house without reading the instructions. On the settings I only knew that the 4 tone mode is the deepest and fastest mode. Setting the sensitivity of 93, connecting the wireless headphones and making a ground balance, I went detecting. The noisiness of the detector did not frighten me, the Racer was not much different, and for professional detectors this is normal. And then, among the light crackles of the background interference there was a clear signal, the VDI was stable and above 50 and this, of course, was a euro 20 cents coin, but the most interesting thing was that at the next rather fast sweep of the coil, I heard three clear signals in the headphones. There was no doubt that it was three coins lying side by side. Surprised by the high sweeping speed and the clear separation of the signals, The Kruzer intrigued me. I liked the sound of the detector very much, which I missed in the Racer. I will not describe my detecting trips to “empty” places with new finds, since such I often find such stories less trustworthy, but I will say with the Kruzer, I had more finds than with the Racer for that whole season. For some reason, I’d like to compare the Makro Kruzer with the Deus. Maybe because the friend with whom I often go detecting has it, or the fact that I also own it. With the Kruzer, it’s all different. You feel that your detector is on the same level, and sometimes even bypasses the Deus. But this is all biased and maybe a bit emotional, so let’s look at the pros and cons, and compare the Kruzer with the Deus and the Makro Racer 2. On some forum, I read that this manufacturer wanted to make the same detector as the Equinox, but that they did it better. So the pros: in comparison with the Deus, you have very simple settings, you do not have to bother and think what program to use. By the way, I still have not read the instructions of the Kruzer, I go detecting in 4 tones, Sensitivity at 93, Frequency 19. The second thing is a very fast response from the target and excellent discrimination. 99% of the time you will know if you have iron under the coil or not. 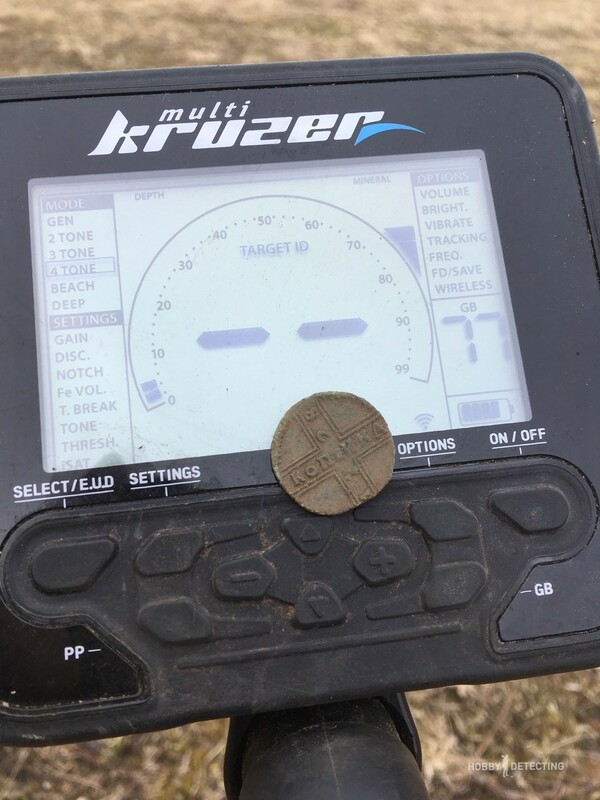 Although the test I did was fast, I buried 2 Kopecks from 1812 about 27 cm deep, and to my great disappointment, the Makro Racer 2 did not see the coin, unlike the Kruzer. One more plus is the weight of the detector. Getting used to the Kruzer after detecting for 6-7 hours in the fields and then picking up the Makro Racer, I can no longer understand how I carried this weight before. A big plus is the waterproofness of the Kruzer and the good quality of the design, it really does not fear anything, after detecting you just have to wash it under the shower. Wireless headphones are no big surprise anymore, but it’s nice when they are included in the kit. Now the main pros have been listed, so let’s speak about the minuses, or more accurate what exactly I didn’t like. I do not know why, but I just do not like the idea that there is a built-in battery in the Kruzer. I will say at once that nothing bad has yet happened because of this, and even if you forget to charge it after detecting, there is an extra battery set in the kit. According to my calculations, the Kruzer’s batteries should be enough for three normal detecting trips of about 3-4 hours or two big ones of 7-8 hours, but personally I feel somehow uneasy when I see that at the end of the day I already have two empty battery bars, so when I get home I immediately put it on charge, and it charges quickly. I cannot say anything more on the minuses. 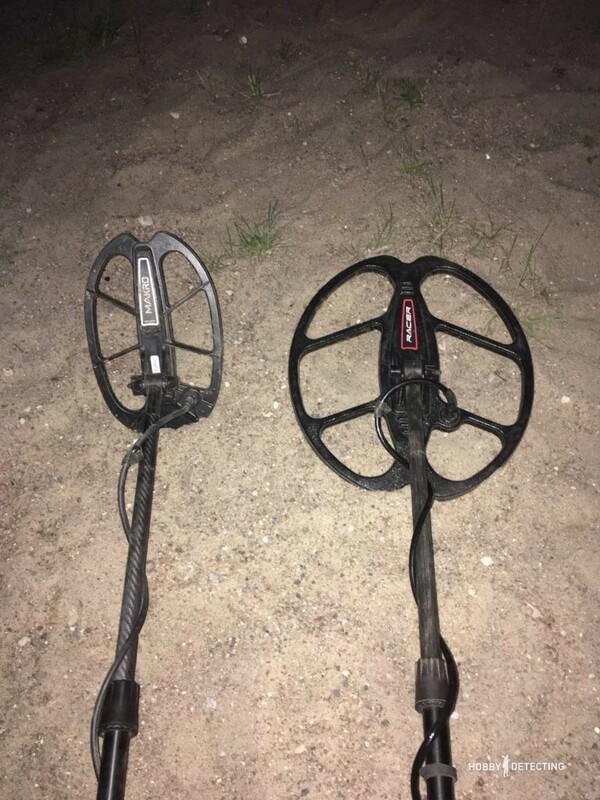 I would definitely recommend this detector to professionals and the level of price and quality is one of the best offers that now exists in the world market of metal detectors. 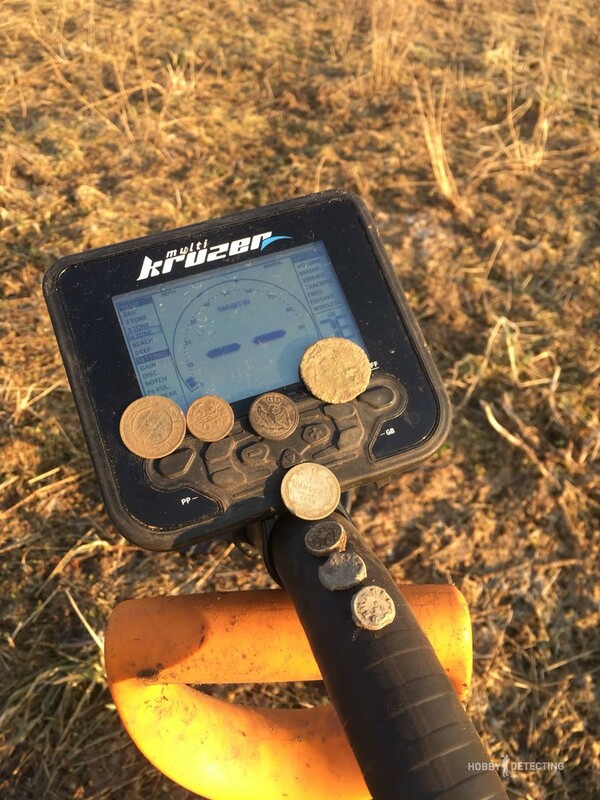 What can be said – all the functions are good, and our team made a conclusion – this turned out to be a good and versatile coin hunting detector, and even at an affordable price. The version with one frequency is especially outstanding, both in price and specifications. All the detecting updates, news and the best reviews are available only in the blog Hobby Detecting. And if you have something to share with us and all our readers – send your news and digging stories to us and we will publish them!